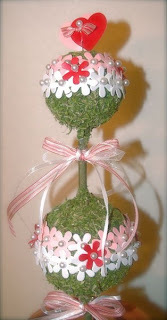 It's time for a pretty topiary submitted by Pam Smerker! This would be great home decor or a special decoration for a party. This topiary was already assembled and covered with moss when she acquired it. She added the flowers cut from white, red, and pink cardstock and attached them with wedding pins. For finishing touches, she tied ribbons to the stems and added a topper made from die cut hearts. 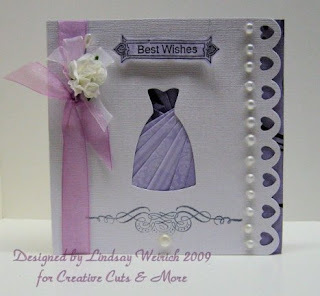 This pretty card was made by our newest permanent Design Team member, Lindsay Weirich. 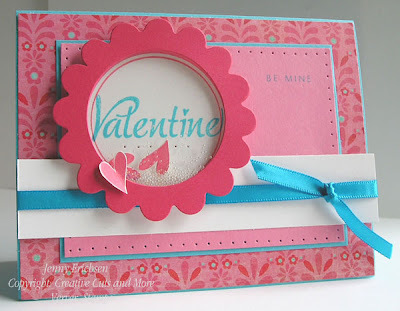 She used the dress cut-out in the card as the frame for the pretty iris folding technique. If you'd like to try it, Lindsay shared the iris pattern on her blog. The Square Scallop 5 1/4″ Vertical Dress Window Card was cut from Diamond White Bazzill Bling cardstock. For a little extra decoration, Lindsay punched little hearts out from each of the scallops and added a border of pearls. This card is such a fun and creative option for bridal shower cards, engagement cards, or even invitations. 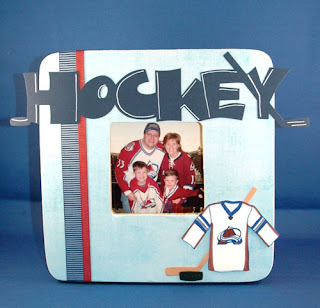 Design Team member Pam Smerker is a long-time fan of the Colorado Avalanche, and she and her family are all decked out in team gear! How appropriate that she'd create a special frame for this photo! Pam used a rubber stamp (with some alterations to account for sleeve length and the logo) for the jersey, and used the Hockey Stick and Puck die cuts from CC&M to embellish the frame. Creative Cuts and More does offer a few more sports-specific die cuts like an Award ribbon and a Volleyball... and more dies are being added every week! Natasha Sansoni is another of our special Guest Designers, and here is here first CC&M project. 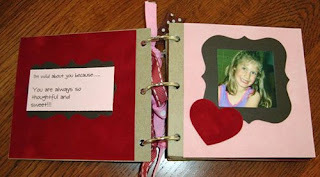 She made a fun chipboard 4"x4" album for Valentine's Day. As you can see here on the inside, she used the Antique Elegance Frame and the Heart #02 Small, both cut from Velvet Paper. If you'd like to see more, Natasha has a special section within her gallery to show additional photos of her book. 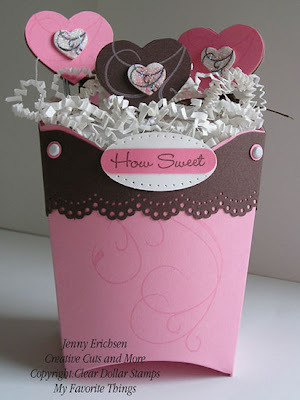 More eye candy from Jenny Erichsen! This is a shaker kit, which comes with the outside scalloped border (in this case cut from Bazzill Smoothies Berry Sensation), acetate, white round die cut and pop up foam. The small hearts within the shaker were stamped and then cut out from white cardstock and clear microbeads were added. 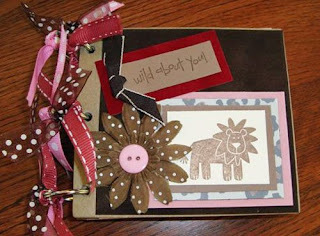 On her blog post, Jenny said she thought it was much easier to use the kit instead of trying to make her own. We're so excited to show the very first item submitted by one of our new guest designers. This pretty French Fry Box was created by Jenny Erichsen. Inside the French Fry Box, you'll notice she created beautiful decorated paperclips using chipboard and shrink plastic hearts. Imagine how cute this would be as a gift for Valentine's Day! We'll have more to share soon!